This entry was posted in Blu-Ray, Months, November and tagged blu-ray, brad pitt, hunter mccracken, jessica chastain, movies, november, sean penn, terrence malick, the tree of life. Bookmark the permalink. I havent watched it since I first got the blu, I watched it twice the week I got it, but its been awhile now. It’s a very very beuatiful, thought provoking, challenging film. I love this one. glad you do too! I watched it twice back to back when I got it on blu. So damn good. I’m debating getting it on blu. Have you seen the film? If you haven’t…it’s a gamble. Stunning looking blu either way, though. I loved this film. I’m really glad you liked it. The slow hypnotic pacing, minimal dialogue and vivid imagery really demands your attention. Malick’s direction is very similar to Refn. Definitely can see that similarity. I hope Refn keeps finding his own style. His new piece ‘Only God Forgives’ looks interesting. This is one of those many movies that I really want to see, yet haven’t had the chance. I’m very curious to see what you think, you should check it out! I’ve watched this a few times since I saw it early in the year and loved it (I picked it as the best movie of 2011). It’s quickly become one of my favorite films and it’s really amazing to see Malick’s imagery. Nice review. It was definitely one of my top picks from last year as well. Thanks! I’m one of those people that wasn’t a fan of the film. I would preferred if it stayed focused on the family and jettisoned the creation of the universe part. To each their own. That seems to be one of the most common complaints I read about the film, but on a large scale they are connected. To me, it’s a film about the importance of our lives even though they are microscopic and insignificant on a larger scale. I have this in my stack and I really should get to it. Thanks, Andy. Yeah, the dinosaurs were a bit much, but Malick’s vision and prowess is unlike any other and I just could not take my eyes off of this flick once it all got started. Good review Andy. I liked the dinosaurs even if I didn’t get why they were there the first time I watched the film. It’s easily his most hypnotizing movie, and that is really saying something. Thanks! I saw this at the cinema but had read nothing about it and had no idea what it was about. I guess I was expecting a drama so I had a hard time with it to be honest. If I had gone in knowing what to expect, I think I would have enjoyed it much more. It’s a powerful film with some strong messages, I just wish I had been in the mood for it. Very fair assessment and I feel like that unexpected reaction is what drove many to hate the movie. That’s mostly why I would be curious to see what a repeat viewing would do for you. Definitely need to get round to this one just to see what all the fuss is about. My brother ranted at me for about half an hour as to why it was the worst film he’d ever seen! You really should, it’s a film that needs to just be seen. No amount of writing could possibly do it justice and people’s takeaways are literally on both sides of the spectrum. I’d be very curious to see what you think about it. Love, love, love Tree of Life. A mesmerizing experience. The cinematography and visual effects are superb. Brad got an Oscar nod for Moneyball but this was the superior performance. Jessica Chastain was great too, I love her. Agree 100% re Pitt nomination for wrong film. Mmmm I love Jessica Chastain too. I agree about Pitt, the only performance that still doesn’t totally make sense to me is Sean Penn. I think the role could have been filled with someone else. She’s incredibly gorgeous, isn’t she? Glad you agree about Pitt. And about Sean Penn, anyone could’ve filled that role. It’s not that Penn wasn’t good in it, it was just not an interesting role with not a lot to do. She is incredible. A friend of mine just got to meet her after a play she is in. So jealous. I’m not even sure an adult was needed for the role. I didn’t really like that Sean Penn was there in the end with all the other actors still from his memories. Why is he the only one that aged? I’m jealous, too. And you’re right, it didn’t even need to be an adult. That role could’ve worked either way. It was pretty underdeveloped. Huge fan of Terrence Malick, Days of Heaven being my favourite of his. I have always enjoyed his contemplative style, The Thin Red Line being one of the most sincere and touching war movies I have seen. 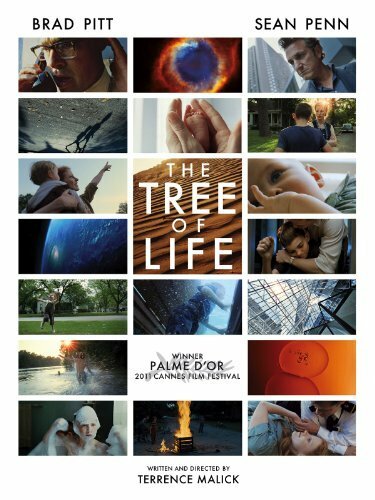 Tree of Life is the second time I have not connected with one of Malick’s movies (The New World being the first one). I think it is indeed a return to form. But to me, there are more misses than hits: the dinosaur portion, the last few minutes of the movies, when masks and memorabilia sink in the ocean… To me, the metaphors were so clumsy, and obvious, to a point that I got irritated when I was watching, and a tad uncomfortable. There are amazing parts, as usual – inner monologues of the characters, and the Zbigniew Preisner’ Lacrimosa during the “creation” sequences. But overall, to me, a disappointment. Le Clown – I understand exactly what you mean, your wife shared similar sentiments about the film on Twitter. Some of the ham-fisted approach to those artsy shots didn’t bother me the first few times around but they did get to me a bit more this past time. It’s one of the reasons I would have a hard time defending this movie to someone that didn’t care for it – I simply don’t understand the intention behind it. I’m hoping Malick’s upcoming films have a bit more mainstream appeal to get more folks interested in his films. Loved it! This was one of the best from last year. Nice to see top marks here Andy. I was dying to see this movie, having been a fan of Malick’s for many years (Badlands remains my favorite; Days of Heaven is my second). My friends who saw it ahead of me, were eagerly waiting to talk with me about it, as they loved it. And when I finally did watch it, I nodded and agreed that it was a superbly well-crafted and memorable experience. But it was an experience I have little interest in revisiting, as I’ve enjoyed stories about fathers and sons far more elsewhere. I do like the film, however, and I’m glad that it continues to be embraced as the work of art that it is by many whose opinions I respect. It’s simply that, like many spiritual beliefs, the connections don’t gel. Feel free to disagree. I have yet to hear a convincing commentary on how it does, and I remain open to being persuaded to think otherwise (bear in mind that I do enjoy surrealism and appreciate abstract art). …the connections don’t gel [in a manner which impresses me]. I think you make a very valid point about it being like spiritual beliefs and that’s partly why I don’t think I could persuade or defend the film. Since the film is so personal if it doesn’t click with you it may not ever click with you, even if you do appreciate it on a technical level. There’s nothing wrong with that at all, we’re all made up of different experiences. Wow, I’m someone who watched this once and had very mixed feelings about it. One thing I know for sure though is that I never would want to rewatch it…. Because it felt like something you would watch in a museum, nice imagery, but in the end it didn’t manage to grab me/hold my attention. Ah, understood. Very common feeling for people that didn’t care for the movie. This was in my top three of 2011, number 2 I think. It is a movie I see in my minds eye everyday. It is just so true in concept and conviction of life. Check out my review. Excellent essay you did here. Thanks, I’ll check out your review of it! The blu-ray presentation is phenomenal. The creation scenes literally had my walls pounding from the sound and the picture is hard to peel your eyes off of. I guess I’m in the minority who thinks “Tree of Life” is neither genius nor garbage. I think it’s a very well made meditation, but not really a “film” in the sense that we normally think of it. It’s as if the ending of “2001” was spread over an entire movie interspersed with a coming-of-age story that had nothing to do with the esoteric visuals. I enjoyed the movie, but I’m not sure if I’d watch it again. It’s definitely not for everyone. The two main “stories” may not directly tie to each other, but I think the intention was to show large scale creation and growth and the same on a very small scale. Maybe that was not the intent, but that’s how I interpret it. You’re right, though – definitely not for everyone. Yep, I believe that was the intent as well. This is a large-scale “experimental” film that was more about the message than the story. The visuals were amazing (even during the character-oriented portions) and everything builds to a larger idea. Most films are plot driven rather than theme-driven, but that doesn’t make this approach any less valid. It seems that most people who liked the film understood what it was trying to do and grasped that concept whole-hardheartedly while those who didn’t like it just didn’t get it. I wholeheartedly agree on all fronts. Wow, lot of love for the film here. As someone who loathed the movie I feel I need to defend my viewpoint. It’s certainly not that ‘I don’t get it’. That’s a bit much. I get what he aspired to do. My problem is that it doesn’t work. The family’s story may have been vaguely interesting but it is certainly not involving or moving in any way. Sean Penn even went on record to say that it lacked ’emotional resonance’. Also, while the film looked good, the whispered voiceover was incredibly alienating and grated almost as much as Malick’s fetish for floaty dresses and Chastain’s feet. As for the long creationist montage… sigh… still feel it was pretentious and manipulatively put together by a director imposing his ego on an unsuspecting audience bored rigid by being made to sit through what seemed like Malick’s entire childhood memories. Nothing wrong with having an opposing viewpoint. I can certainly see where you’re coming from though I obviously disagree. I want to write an essay about this film w/ attention to trees and its yogic theory of continuity across space and time. What did you make of the dinosaur scene? Lots of people read into what transpires between the two creatures…animals showing compassion? I would love to read that, if you decide to write it. Compassion was my first thought but I’m not so sure now. It could be as simple as the carnivore not being hungry and therefore not killing the wounded animal, which could easily be seen as something resembling compassion. Yeah, a biological versus moral reading! I love that in Texas, movie theatres had to put up signs saying NO REFUND on this film b/c so many confused viewers wanted their money back…it must be good!